About a year ago I had made a post about a large "3.2 km long Slogan" in Chile. Today I present an incredibly huge word which is about 4 km (~2.5 miles) long and slightly less than a kilometre high. 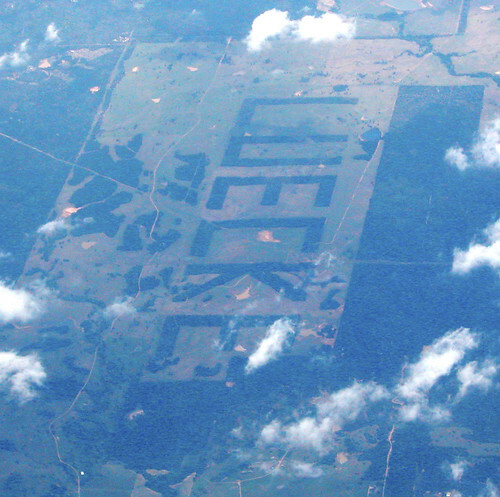 Each alphabet is about 945 metres (3100 ft) tall and 518 metres (1700 ft) wide. Here is its view from an over flying aircraft. 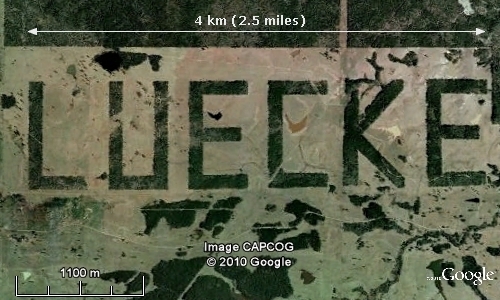 It was reportedly created about 25 years ago by the landowner who selectively cleared the tract to inscribe his family name 'LUECKE'. No one knows the real purpose behind creation of this gigantic word. Some say that he destroyed precious pine trees to create it, while others say that it was all scrub brush, very little pine and the word was created by bulldozing the brush and using the clearing as a pasture land for the cattle. Some say that he had an agreement with the local authorities that the area on which he builds something will not be acquired, so he decided to make the word as big as his holding thus preventing any takeover. Whatever be the reason it surely one of the very few man-made objects which can be seen from the space.